We can help you achieve a perfectly white smile using our simple tooth whitening procedure. Tooth whitening is one of the most popular treatments we offer. We can gently remove staining from your teeth using a painless bleaching tray technique. You control how white your teeth become by how often you use the system. 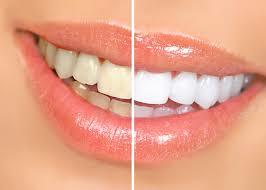 Tooth whitening (bleaching) is a cosmetic procedure for lightening the existing tooth colour. The chemical used for whitening is either hydrogen peroxide or carbamide peroxide. The chemical in the form of gel is usually applied using a specially made tray fitting your teeth. This procedure involves 3 short appointments; first a 15 minute appointment with a dentist to assess your suitability for teeth whitening. If your teeth and gums are healthy (i.e. no cavities or gum disease) we will take impressions of your teeth, which then go to our dental lab where custom-made whitening trays will be made. At your second appointment a week later we will fit your trays and give you instruction on how to whiten your teeth at home. Finally, after 3-4 weeks of using the whitening we encourage you to come back for us to review the new shade of your teeth.